Melanie teaches because being involved in music has always been her passion and her calling. She’s been teaching privately and in local studios for the last 10 years. She is dedicated to instilling a love of learning and encouraging individuals’ gifts. 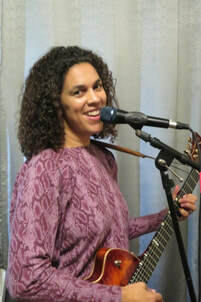 While Melanie has a unique teaching style that includes ear-training, chord voicing, harmony, theory and improvisation, she supports the Classical, Orff and Suzuki approaches as well. Her emphasis has been on Jazz, Folk, Rock, Soul and Gospel. She’s been singing solo and with groups all her life, which was easy -- having a mother as a professional musician, and later marrying a professional musician. She studied music at West Valley College and San Jose State, then went on to hone her skills through private lessons -- including studying with Tuck Andress and Patti Cathcart. Seasoned with 25 years of guitar experience, she plays with local bands at restaurants, weddings, events and ventures in home recording. She’s enjoyed leading songwriting workshops, and facilitating music for schools and church functions for many years, along with holding behind the scenes production roles, serving four different school districts. Having taught many different kinds of learners, she is confident in her ability to make learning fun and help students overcome obstacles in their playing.